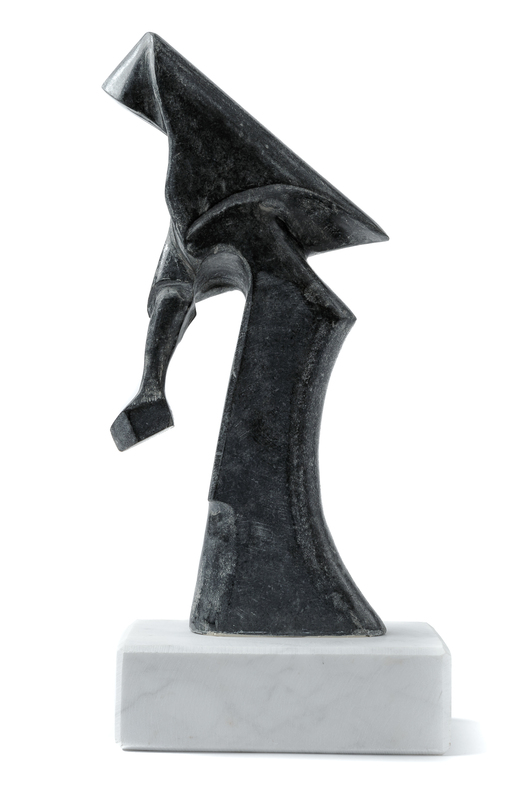 The two inventively stylised Motherhood and Laundress sculptures are a genuine tribute to the famous artist Maria Lai, as they are inspired by her artworks. The Onda (wave) wall light has clear-cut and essential lines that emphasise the fine material rendering of the hand-worked Sardinian biancone marble with a cracked front curvature that sheds the light into the room with an impressive scenic effect. 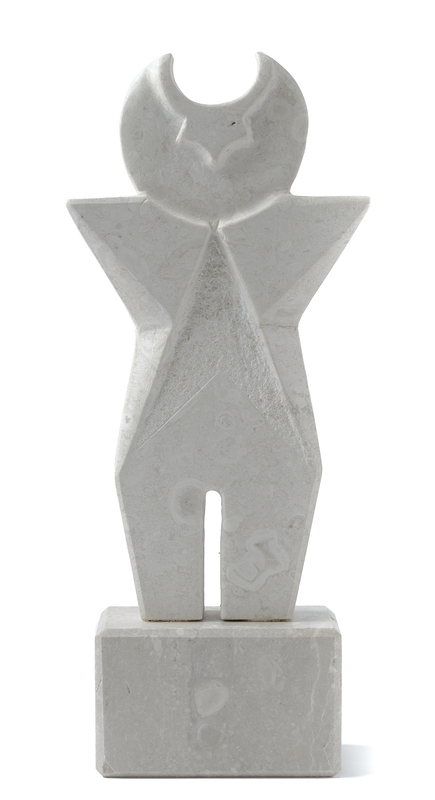 Inspired by the archaic figures of Nuragic culture, the three sculptures of the Warrior, Archer and Bull God are sculpted with fine distinctive stylisation in Orosei marble. Produced as one-off creations, each of them has original stylistic details and inspiration. Reviving the renowned local tradition of jack knives, this knife called Preta, stone, is made with technical virtuosity in shaped green marble, with a steel blade and engraved brass ring joint. Designed as a collectors’ and connoisseurs’ item, it can be customised to order. 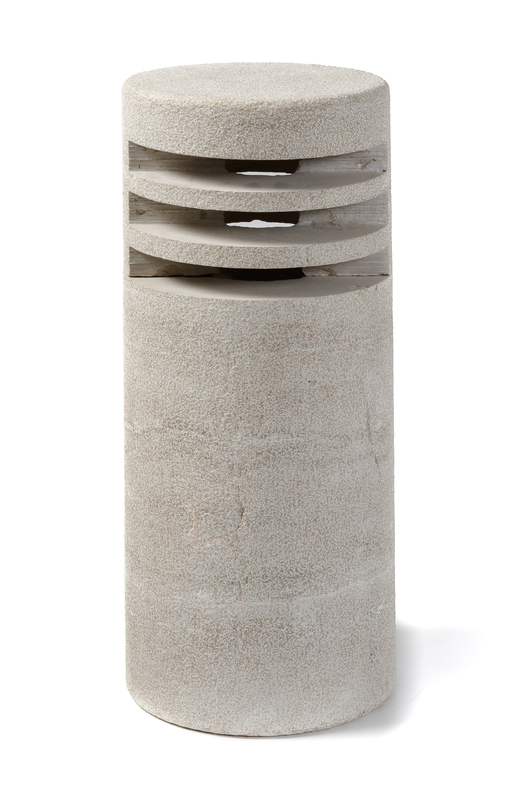 This cylindrical lamp in Sardinian biancone marble handcrafted with cracked openings that sheds the light with an impressive scenic effect has clear-cut and minimal lines. Stone is part of the beautiful landscape of Sardinia and it has always been used as a functional resource and means of expression in the local culture. As with other crafts, the practical and stylistic evolution of stone processing has followed a trend of archaic origin. The majestic megalithic constructions of the Muragic period embellish the scenery of Sardinia, being enigmatic symbols of an ancient people who used to craft stone and left the precious design of its vital contexts. Stone was a functional element of daily life and spiritual, ritual and sacred activities. Over the centuries, the use of stone has followed local historical events. The main influences have left tangible signs in the architecture built by the Romans, the Pisans, the Aragonese, until the age of Savoy. Particularly important on the island landscape are the religious structured built by the Pisans with the contribution of foreign workers and which are embellished with decorative elements, finely carved in stone, large symbolic repertoires of medieval patters, with plant, zoomorphic, anthropomorphic and geometric motifs, which were included and became part of crafts, such as carving and weaving. Typical are also the decorative elements of Catalan style embellishing the main civil and religious buildings of the island. The lintels of windows and doors, the capitals and bases of columns, carved in red trachyte from Fordongianus or the basaltic lava from Abbasanta, are a valuable and impressive testimony to this history. Nowadays, stone is interpreted as a new resource of the crafts sector, in particular included into architectural contexts and for residential, public and private use. The technological evolution of the sector can adapt processes and products to the different needs of everyday life, where the aesthetic value combine the usability of stone, with its local peculiarities. The strength of the material is combined with the aesthetic preciousness of great visual impact, with forms that start from nature and are transformed, smoothed, engraved, cut so as to create new features and aesthetic interpretations.